For the preparation of rice soup, more or less dense, it brings the boiling broth, or stew, adding 8 g or 15 or 20 or 40 or 50 of rice for every 200 grams of liquid. It has a warning to choose a type of rice resistant to cooking. For the cream, tomato, fish or different sea fruits, are recommended 8 or 15 g of rice. This amount also applies to creams of vegetables. For rice and sausage soup with vegetables and legumes, or with chicken livers, gizzards and offal of chicken are enough 50 g of rice each 200 g of liquid. Cooking times vary on the quality of the rice and the preference of the diners. Usually you turn off the heat under the pot when the rice is not too soft for the teeth and let it to finish cooking with the cover (no more than 10 minutes) until is ready to serve. In some Italian regions, Veneto, for example, it starts early with a fried, like risotto, lightly gilding onion, garlic if possible and vegetables that make up the soup. Then it is added the rice, and then all at once, the boiling broth. Sometimes the sauce is prepared separately and added to the broth along with the rice. 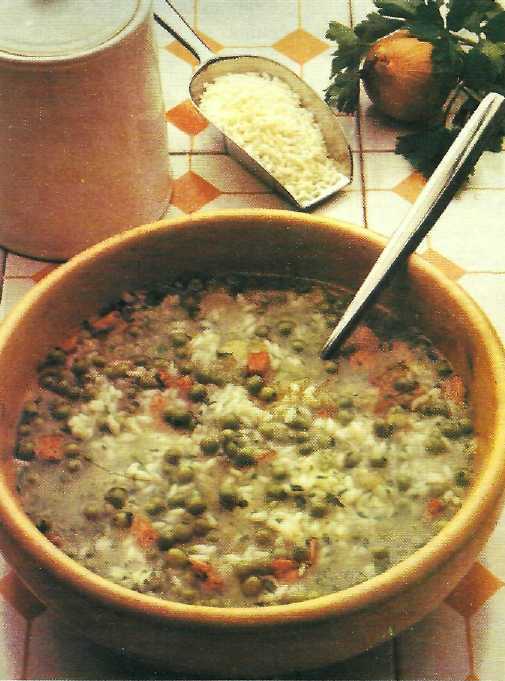 For vegetable soup with rice, to serve warm or cold it is preferable to use cooking rice yields through resistance to a particular treatment. Some suggest to cook the rice separately (rice pilaf) and add to vegetable soups cold or warm slightly before serving. 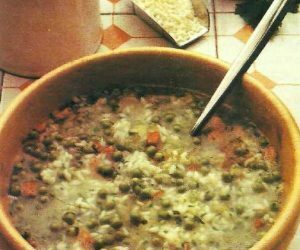 A spring soup with rice and fresh peas. Typical Venetian cuisine, has the genuine taste of food.